Topper Industrial designs and builds Industrial Carts (Mother/Daughter Cart Systems, Quad Steer Carts or Tracking Carts, Specialized Delivery Carts, Transfer Carts with Roller Deck, Static Carts, Rotation Carts, Tilt Carts or Kitting Carts). Topper Industrial carts are best discovered by function. The Topper Mother-Daughter Cart Delivery System eliminates lineside forklift deliveries with the mother-daughter cart which can pull a variety of different daughter cart types. When locked together, the carts are tugged as one unit, supporting unlimited lineside manufacturing deliveries and applications without the need for forklifts. At the assembly line, the operator swaps out a full daughter cart for an empty one and can work directly out of the carts. Unmanned tuggers work with powered and non-powered carts in a virtually limitless range of configurations. Topper Material Handling Heavy Duty Industrial Carts have features and flexibility which allow for production complexities, previously handled by fork trucks. FTF (Fork Truck Free) carts are revolutionizing the way materials move and part of Industry 4.0 initiatives which recognize that fork trucks are no longer the safest or most efficient way to move material on the plant floor. Topper Industrial Quad Steer Carts are used in conjunction with a tugging vehicle such as a tugger, Automated Guided Vehicle (AGV) or a mobile robot. A Quad Steer Cart is an industrial cart with four-wheel steering which track smoothly when being pulling with multiple carts in tow. They are designed to handle tight turn radiuses and are used to deliver and pickup material from a specific route along the factory floor. The Quad Steer Cart can remain attached to the vehicle with multiple carts in tow. There is no need for uncoupling during delivery and pick up applications. Quad Steer Carts are often referred to as Tracking Carts or Delivery Carts. Topper Industrial is able to design and fabricate all types of industrial carts for custom application. 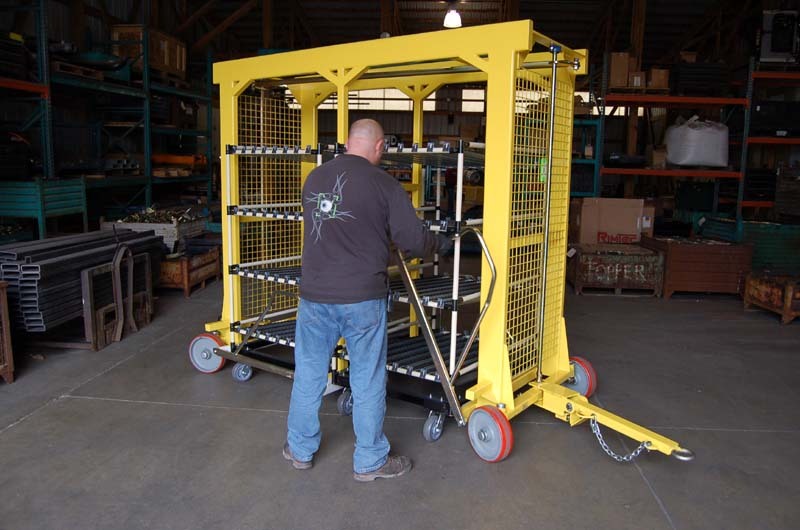 Industrial Specialty Carts serve as unique and innovative material handling solutions that establish a better and more ergonomic work environment for material handlers and operators. An example of a specialty cart created to solve a specific problem would be the Transformer Cart. This four-wheel steering industrial cart transforms into a hand operated push cart and back again. The Optimal Steering Cart or Transformer Cart is a wise solution for older factories that have an issue with narrow aisles. 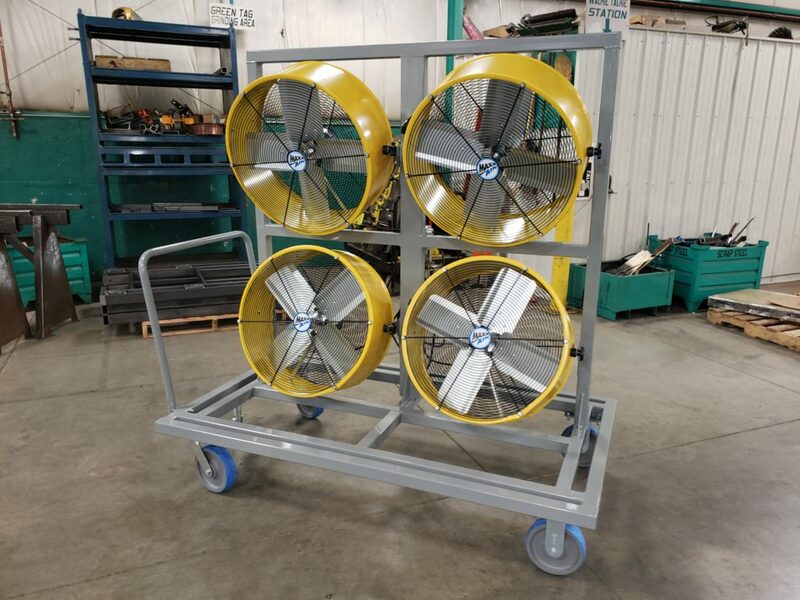 An Industrial Fan Cart is another example. The innovative Industrial Transfer Cart for the supply chain is equipped with a conveyor roller top. The rollers aid in the transport of specific content in a conveyor-like manner. Most transfer carts are used in conjunction to a stationary conveyor system as a way of getting material to and from the conveyor. These carts can be retrofitted and designed so that it is able to work with an existing conveyor system or lineside equipment. Transfer Carts are offered in a four-wheel or six-wheel design. 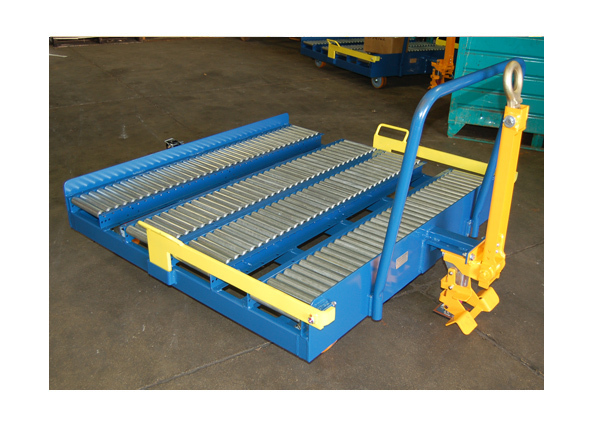 Transfer Carts are often referred to as Industrial Carts with Roller Deck. Parts deliveries to a production line are challenged as horizontal space is at a premium and lean manufacturing, Industry 4.0 initiatives are driving global adoption of Fork Truck Free solutions utilizing carts by function.